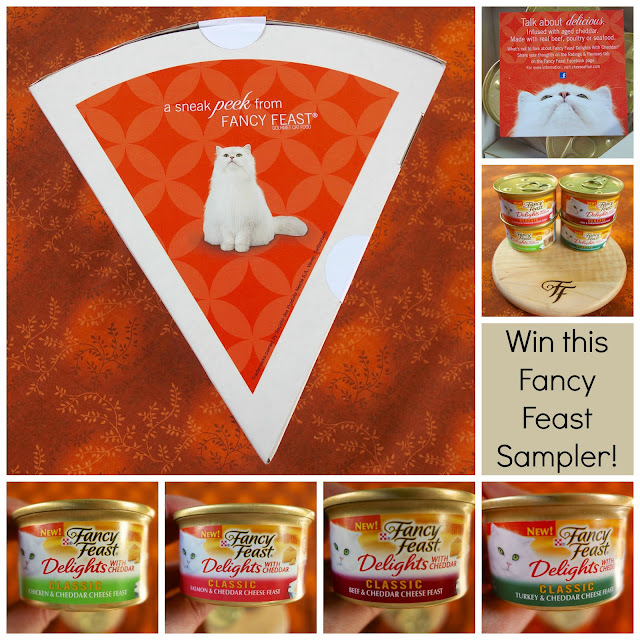 Fancy Feast Cheddar Delights Giveaway! The nice folks at Fancy Feast sent the cats some samples of their new Delights With Cheddar. Delights with Cheddar has four new varieties in the classic style. All three of the cats loved the food! I am adding it to their food rotation. To celebrate the launch of the new Delights with Cheddar, Fancy Feast is hosting a “Cheese Affair Pin to Win” Sweepstakes. The entry for the grand prize, a trip to New York City to attend a grand Cheese Soiree hosted by cheese expert Liz Thorpe, begins TODAY! I want to win! To enter the Fancy Feast “Cheese Affair Pin to Win” Sweepstakes, visit www.CheeseAffair.com. Follow the links provided to complete and submit the registration form. Click the “Pin It” button to pin the available image to one of your Pinterest boards. Complete these steps during the entry period for a chance to win. Fancy Feast is going to giveaway sampler packs of the new Delights with Cheddar to 20 lucky Plain Chicken readers! The contest ends on August 11, 2013 @ 11:59PM CDT. The winners will be contacted by email. If the winners do not respond within 48 hours, new winners may be selected. Good Luck! my kitties are like me & love anything with cheese !! Forgot to give the flavor he'll love the chicken, well probly all of them. Oh boy!! My Mamba would LOVE to win this! He would love the turkey and beef flavors the best. My cats would think they had died and gone to cat heaven if I gave them any of the flavors. They have never had Fancy Feasts... poor babies. He's a 4 month old kitten, so he's a bit of a pig, lol He just learned how to jump up on the counters, and I have to keep everything put away! He will eat anything. He'd like ALL of them! I've got four mouths to feed and they all love cheese. Casey would love salmon and cheddar for sure! My cat would love the turkey one! My cat would like the salmon most, but would gobble down any of them. Tigger would LOVE turkey & cheddar. If we win, he will be a big fan of Plain Chicken!! My cats would love the salmon and cheddar. Your guys are giving you the eye about giving away cat food! Our cat is obsessed with anything cheese flavored...she harasses us every morning just waiting to hear a can being opened. Baby loves salmon and he loves the cheese in his food so that's definitely going to be his favorite. My kitty would love all of them!! I have a grand-baby who happens to be a cat! She loves to eat and would really enjoy some Fancy Feast! According to my monster boy, Logray, there is no other cat food but Fancy Feast!!! He ♥'s all the flavors! This is great. I'm always looking for new flavors for my cats as they seem to tire of the same food. My cats are more into fish flavors so salmon and cheese would be their favorites. My cats will love the Salmon and Cheddar Cheese Feast the most! My cat loves anything salmon! Wow! I net my five fur-babies would love these, too! Thanks for the giveaway opportunity! My cats would like the Turkey and Cheddar Cheese Feast. Daisy would probably like salmon the best! My cat Gretchen would love the Beef and Cheddar Cheese flavor. Fancy Feast is the only cat food she eats. I am sure my kitty would love all those flavors!!! I have never tried this brand for my cat Felix, so would love to win the samples and see if he likes it. I bet he will love the Chicken and Cheddar flavor the best! My cats would love the Turkey and Cheddar flavor. But I'm wondering why there's no bacon and cheddar flavor? 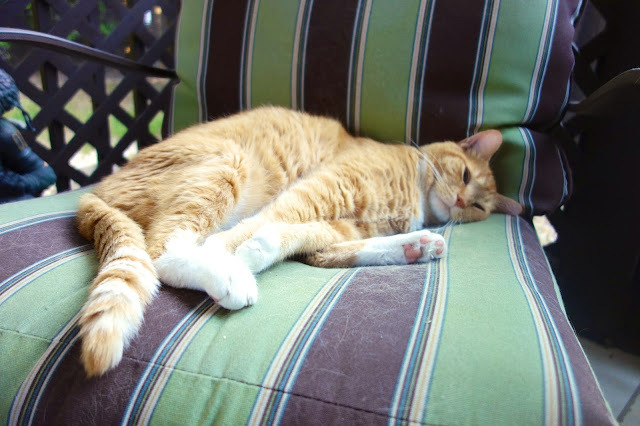 Our cats deserve to be just as obsessed with bacon as the rest of America. Not sure which one my 19 year old cat would like, she is getting very persnickety with age, but I am willing to try anything to tempt her! My cats are beyond spoiled and would love to try this new food! Big T would like the Salmon & Cheddar Cheese flavor the best. I'm going to say Cheddar and chicken, but they love all Fancy Feast canned meals. I have 3 cats that LOVE cheese so I think it's safe to say that they'll love all of them! I would love to give our kitties the chance to try out these new flavors. Anything with chicken would be right up their alley. My cats would love the Turkey and Cheddar Cheese Feast. My cat will like the chicken and cheese feast! My kitty loves cheese so I think she'd love any of these flavors. I think my boys will like any/all of them but chicken with cheddar sounds tasty! We rescued a kitten off of the side of the road back in June and she's our first cat. 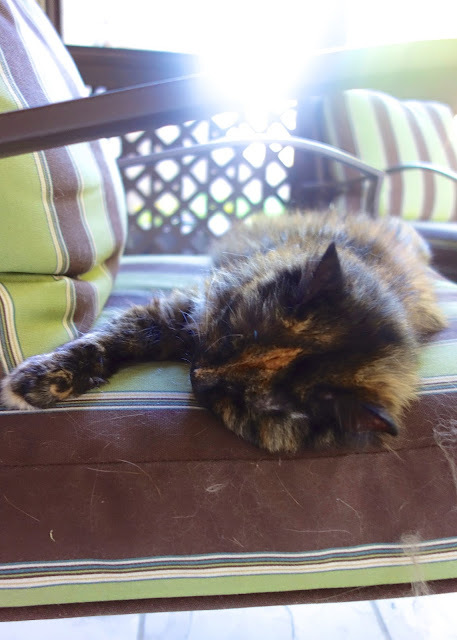 We're new to this cat business and would love to win to see what she thinks of this new food. My kitty loves other varieties of Fancy Feast so I am sure he would love this new type with cheddar cheese! My cat would love the salmon and cheese flavor! My cat would love the salmon and cheddar! My Sparky would love the Beef and Cheddar! We'd probably start with Chicken and Cheddar Cheese Feast, but I'm sure our cat would love all the new flavors. Thank you so much.